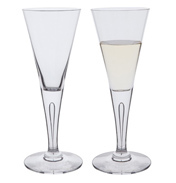 This crystal glassware is also one of Dartington’s iconic designs brought originally to you by Mr Dartington himself, Frank Thrower. Remarkably 2011 marks the 40th anniversary of this exceptional range as the Sharon Suite was first launched in 1971. It is a true reflection of how great the original design was to say that it is still as popular today and remains one of Dartington’s best selling ranges. The Victoria and Albert Museum (V & A) hold pieces of Dartington Sharon, including the Sharon Goblet, Sharon Champagne Glass and Sharon Decanter, in their prestigious collection and in London they have it displayed in their showcase of 100 greatest ever products, the quality and design being of the highest order. Of course, this accolade must be awarded to Frank who was Dartington Glass’s sole designer for the first 20 years. What other proof do you need that this great design is timeless? Mr Thrower started a legacy of naming glassware after ladies and Dartington still carry on this tradition today. It is thought that his designs were named after girlfriends, family and friends. The name Sharon is Hebrew and is a very popular first name, although it is also in use as a last name. It means ‘fertile plain’ and was also a Biblical place name and is indeed used also for this use today – the UK even has a couple of Sharons. The name is also subject to many a nickname which you won’t find us using here, no thank you! 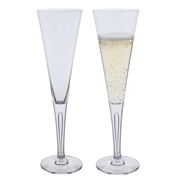 The Sharon range has very straight lines with a distinctive v shape or this shape is sometimes called conical or cone shaped and is very stable. This is a much copied design by many other brands. 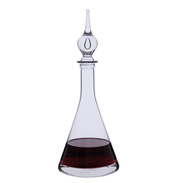 The V shape is not really to be used for the tasting of fine wines where you need to swirl the wine to bring out the flavours as the conical shapes does not allow this to happen easily. 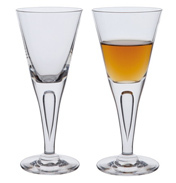 The Sharon glassware is stemmed, and the long tapered stem merges in with the bowl. It has a characteristic ‘bubble’ in the stem shaped like a teardrop – each one unique and arising as a result of the hand blown and mould production techniques. In particular the V-shaped Martini glass is a star piece in itself and smacks of classic cocktail glass design which stands the test of time. 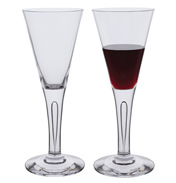 There are a number of different Dartington Sharon glasses to choose between. 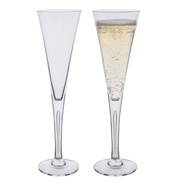 Whether you require a Large Wine glass, Sherry Glass or Celebration Flute this style has it all. From water through to wine everything tastes that bit different when using Sharon glasses.